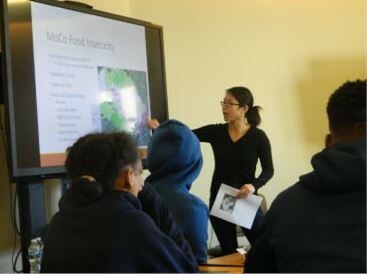 Manna’s Community Food Education Program offers free programming that makes crucial health information more accessible. Manna provides the lessons, volunteers, and cooking demonstration food (if applicable). Any of the workshops or classes listed below can be offered in multiple languages; we simply ask your agency to provide an onsite interpreter. Formerly known as our “Nutrition Education” these interactive workshops cover a range of commonly requested health topics like how to reduce sugar, eat nutrient-dense foods on a budget, and reduce instances of chronic diseases like diabetes. When requested, a Manna volunteer will come to your site, present, and offer your community assistance with their health-related goals and questions. Each presentation lasts an hour, and you may request multiple workshops for your site. BRAND NEW kitchen classroom space at our Community Kitchen, located in Silver Spring. 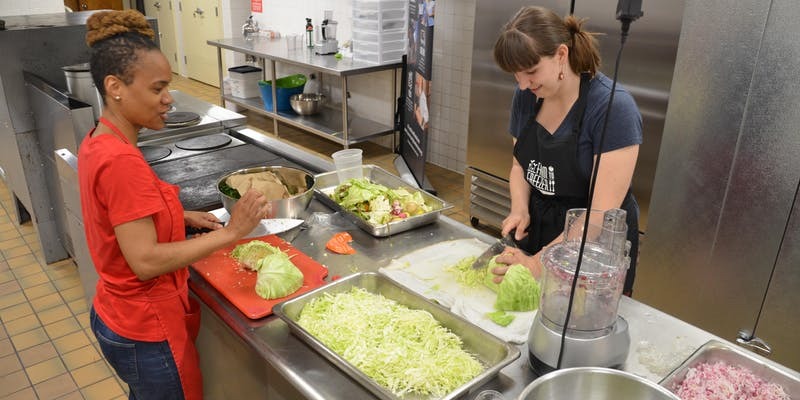 The classes held at our Community Kitchen focus on healthy eating on a budget and offer community members the opportunity to learn while cooking (and tasting). During each hour-long class, we start with a healthy food demonstration, cook together as a group, and enjoy tasting our recipes at the end. We learn how to work around lack of time and money and practice key strategies that encourage our participants to create and eat nutrient-dense foods. We believe that utilizing the right strategies and with access to the right resources, families can enjoy the multitude of benefits that cleaner cooking and eating provides. Classes either can be one-time opportunities or a series. Looking for food education programming specifically for children or older adults? At Manna, we are determined to make healthy eating accessible for all residents of Montgomery County, and we offer specialized cooking classes on our Mobile Kitchen. During each hour-long class, we focus on cooking and are eating foods that focus on meeting core nutrition standards such as more fruits/veggies, whole grains, and plant-based or lean proteins. We cook recipes together as a group and enjoy tasting our recipes at the end. Click here for more information about our Mobile Kitchen. The Mobile Kitchen is open March through November. December to February we are closed. Classes run Monday through Wednesday from 8am to 3pm, and Thursdays from 8am to 12pm. Scheduling preference is given to groups that request back-to-back classes. ***If your group is larger than 12-16 people, we’d be happy to rotate through participants, stay at your location until we reach every individual, or revisit your site multiple times to adequately serve your group. This two-part nutrition workshop series is for individuals living with Type II diabetes or who want to prevent diabetes. Habits to Hinder Diabetes and Chronic Disease covers the standard American diet vs. eating for disease prevention, foods to maintain good health, motivational tips to get started, as well as signs and symptoms that signal a doctor’s visit. An interactive one-hour session that will answer the question: can sugar really be addictive? In addition to the brain’s response to sugar, we’ll cover the 46 other names for sugar, eating tips to prevent or control chronic disease, and offer hands-on practice for identifying healthy food choices. Participants arrange sugar packets to visualize the amount of sugar in common snacks, beverages, and pantry items. A walk-through of our most commonly asked food and health questions designed to dispel eating myths and solidify knowledge around key core nutrition principles. We decode and demystify many grocery store advertisements and descriptions and uncover what organic, made with real fruit, heart-healthy, and low sodium mean for our bodies and well-being. Perceived lack of time and money are the biggest challenges to healthy eating. Utilizing the right strategies and with access to the right resources, families can enjoy the multitude of benefits that cleaner cooking and eating provides. Including a healthy food demonstration and tasting with recipes, this workshop helps to empower families with key strategies for healthy eating that won’t break the bank. Oldways’ A Taste of African Heritage program is designed to help people eat and live more healthfully through a traditional diet—specifically, to incorporate more fruits, vegetables, and other plant-based traditional foods, and to prepare more home-cooked healthy meals per week. With lesson plans that simultaneously teach history, nutrition, and cooking techniques, this six-week series introduces participants to the rich cultural history of African heritage foods while providing them the tools they need to adopt this traditional way of eating for better health in modern day life. This program is for people of all ages, interests, and backgrounds. We also offer the A Taste of Latin Heritage Program, which is a six-week series. Classes are two hours long. For our Kid’s Classes, we use a curriculum called Small Bites, provided by the organization Common Threads. 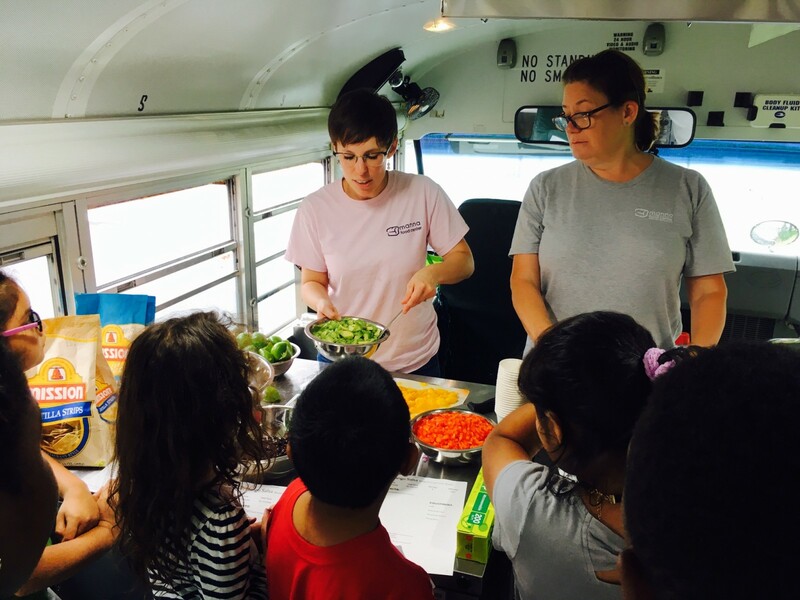 Specifically tailored to children 3rd grade and older, we start all our classes with a hands-on activity, reading, game, or experiment focused around a core nutrition principle. Some of the principles we focus on are eating more fruits/veggies, whole grains, plant proteins, etc. Then, we cook together as a group and enjoy tasting our recipes at the end. The Small Bites curriculum specifically makes recipes that don’t require knives so our students can participate in every part of cooking. It focuses on cooking sides and snacks rather than full meals. It also emphasizes the Common Core and National Health Standards for each grade level through cooking involving science, math, and reading comprehension. Specifically tailored to adults ages 65 years or older, we start all our first classes with a simple recipe that we cook together and a lesson about reducing sugar and salt in our daily diets. After the first class, older adults are able to guide class recipes and discussions with their own lesson suggestions and questions. Each consecutive class focuses on two topics per lesson; a core nutrition principle such as eating more fruits/veggies, whole grains, plant proteins, as well as answering a prior classmate’s question. Some common questions include “what’s a healthy dessert I can make,” “what is a good recipe to make with my grandchildren,” or “how do I cook portions for just one person?” We always answer these participant-driven questions and emphasize core nutrition principles through cooking and eating a recipe. During each class, we encourage our participants to make connections with each other and share their own strategies they use to cook and eat nutritious foods.